Everyone goes through the experience of their first date with someone at some point in their lives, and an upcoming production at Seward County Community College should bring about some memories and laughter about that experience. 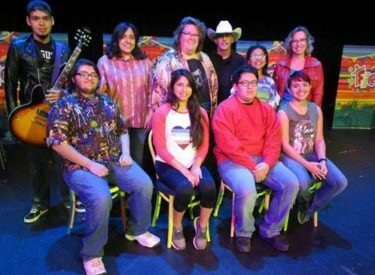 The drama department will be presenting the Gary Soto play “Novio Boy,” which focuses on the story of Rudy as he prepares to go on his first date with Isabella. The humor, director Michelle Van Hessen said, is what drew her to the play. And overall, working on the show has been a great experience. “It’s been great working with people you don’t see every day and seeing how you get along with them,” cast member Fernando Nunez, who portrays Alex, said. “It’s a really new experience for me, I’ve never actually been in a play, much less been a lead, and it’s been really neat because it’s helped me get myself out there more,” Osvaldo Morales, who portrays Rudy, said. The mood among the cast and crew is also positive going into opening night. “I’m really excited about it, I’m ready,” Nunez said. The play will have performances Nov. 16 and 17 at 7p.m., and Sunday, Nov. 18 at 3 p.m., with all performances taking place in the Showcase Theater. Van Hessen and the cast offered encouragement for the community to turn out to the play and support other future productions. “It’ll bring them laughter, it’ll be somewhat of a reminder of when they were that age and everything was so awkward and going on their first date, so I think everyone will be able to relate,” Van Hessen added.